The northern and eastern axes are nearing Mosul’s city limits. The northern axis continues to focus on regaining the towns of Batnaya and Tel Kayyaf, north of Mosul, in order to position forces to breach Mosul’s northern city limits. The Peshmerga entered the Christian town of Batnaya on October 25, but are not assessed to be in control of the city. The Counter Terrorism Service (CTS) is poised to breach Mosul’s outskirts from both the east and northeast but called for an operational pause on October 25 in order to wait for the southern axis to advance such that the encirclement of the city is evenly distributed. The former grand wizard of the white supremacist group Ku Klux Klan, David Duke, cautioned his (presumably white) radio listeners that voting for anyone besides Donald Trump would “be treason to [their] heritage”. He further stated that Mr. Trump has made it acceptable to talk about the “incredible concerns of European Americans today”. Without a doubt, the defining characteristic of Donald Trump’s presidential campaign has been an unapologetic endorsement of nativism. Nativism is more than a mere rhetorical assertion of national identity. At its core, it is the exertion of control over a country’s institutions and policies for the expressed benefit of a dominant ethnic group. Mr. Trump has not been shy about promoting the interests of the white population. His policy proposals include building a wall between the United States and Mexico, banning all Muslim immigration, and ending the H-1B visa programme that has brought so many foreign workers to the U.S.How did things get so ugly? The U.S. is not an obvious candidate for this brand of nativism. In perhaps the most popular patriotic song in the U.S., ‘God Bless the USA,’ Lee Greenwood offers, “I'm proud to be an American where at least I know I'm free. And I won't forget the men who died, who gave that right to me.” Americans tend to define their identity rather obliquely, in terms of “freedom” and “liberty” and the dogged defence of these ideals — hardly the sorts of proclamations that should stoke any kind of nativism. Contrast this to Europe, where identity is often explicitly defined in terms of ethnicity, religion, or language, and where nativist parties like the U.K. Independence Party and Front National in France have been agitating for decades. To be sure, the U.S. has a nativist past, but, until recently, nativism was stuck in the fringes of American talk radio and didn’t seem to have much of a future as a mass political strategy. The world is building more solar-power plants because they are getting cheaper. Since 2009, the total installed costs of solar have fallen by as much as 70 percent around the world. New power-purchase agreements frequently fall below $100 per megawatt-hour, with some reaching less than $30.4 That price puts solar at or below the cost of a new natural-gas plant. Regulatory measures, such as the Investment Tax Credit in the United States, further support the economics of solar. In many instances, solar is often “in the money”—that is, less costly than the next cheapest alternative. A number of leading multinationals are signing solar deals not only to gain green credentials but also to lower their energy costs and diversify their sources of supply. Indians and Pakistanis who agree on nothing these days found themselves nervously giggling in unison at Trump’s offer to “mediate” between the two countries. But unwittingly the bombastic candidate actually flagged one of the foreign policy challenges that could necessitate the next U.S. president’s early attention. In the likely event of a Hillary Clinton win, her administration will no longer be able to count on New Delhi displaying what is known as strategic restraint; Indian Prime Minister Narendra Modi has dramatically altered the traditional Pakistan doctrine with several high-risk firsts. None of the old rules apply. Modi’s electoral campaign in 2014 mercilessly mocked India’s previous Congress government for being too soft on Pakistan and promised a muscular response to Islamabad-backed terrorists; his boasting of having a 56-inch chest came to be the ultimate metaphor for his government’s machismo. But armed with the largest political victory by any prime minister in 30 years, Modi in fact ended up displaying an audacious appetite for gambling on peace instead. The Pakistan Military’s political arm, Imran Khan, is to lay siege of Islamabad on 02 Nov. Tehreek-e-Insaf + LeT + JeM + Lal Masjid + Saim-ul-Haq is a frightfully explosive cocktail. This cocktail, of course, has the backing of the military which further heightens the apprehension. Imran has set the pitch by accusing Nawaz Sharif of humiliating the military. The Af –Pak region is again on cusp as far as US is concerned. So the next chief would be majorly determined by his suitability to further US strategic interests. This is not the first time that the military has unleashed Imran to countervail Nawaz. Imran has issued the ultimatum to Nawaz to abdicate. The siege he has said would be politically fatal to the Prime Minister with no follow-ups and no re-takes. This time Imran’s ammunition is Nawaz’s alleged Panama links. The weapons however are brazenly jihadi tanzeems, some of them internationally proscribed. Yet, Imran is constantly invoking democracy.He has threatened of possible intervention of a third force. This third force is but the military. The military-intelligence establishment is at a delicate juncture given the great uncertainty about the future of Gen Raheel Sharif who is due to retire shortly. The General, a protégé of Musharraf enjoys unprecedented popularity in Pakistan. It is this popularity that is the bane of Nawaz. He in his tenures, as Prime Minister, has appointed four Army Chiefs Gen Asif Nawaz Janjua (91), Gen Waheed Kakkar (93), Pervez Musharraf (98) and Raheel Sharif (2013). So he is no greenhorn in dealing with Army. Betrayed and bitten by Musharraf, he would do everything within his powers to stave off an extension to Raheel Sharif. 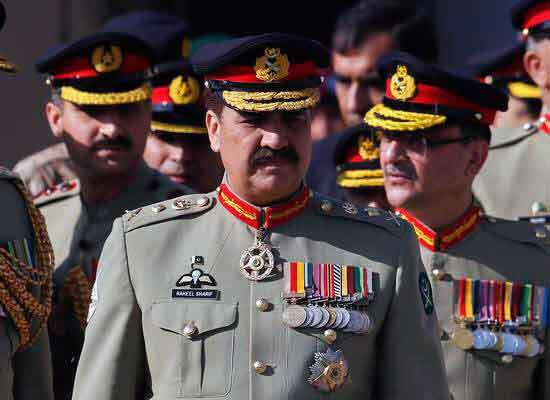 Notwithstanding his posturing, Raheel Sharif would not prefer nor can afford, sudden oblivion. No politician does it and army chief in Pakistan is as cunning, if not more, than a politician. In the 2016 edition of the Fragile States Index (FSI) brought out by the Fund for Peace (FFP), Afghanistan is listed in ‘High Alert’, scoring 107.9 points. It is placed 28.3 points behind India (‘Elevated Warning’); and 6.2 points behind Pakistan (also in the ‘High Alert’). All these scores were based on an assessment made using values placed on various indicators: Demographic Pressures, Refugees and IDPs, Uneven Economic Development, Group Grievance, Human Flight & Brain Drain, Poverty & Economic Decline, State Legitimacy, Public Services, Human Rights & Rule of Law, Security Apparatus, Factionalized Elites, and External Intervention. However, the points of reference used for identifying, calculating or determining the values to be placed against each indicator for each country for each year, are unclear. Perhaps this is the bane of standardised reports on matters that cannot be truly standardised. While superficially, the report gives a general idea of the status of fragility of each country, the purpose and the use of the report ends there. The absence of specifics in the final report, particularly regarding how the parameters were evaluated in the contexts of their relationships with each other, sticks out jarringly. An individual who is less informed regarding issues such as fragility of countries would be given an impression of a reality that is not always quite what it appears as on the surface – and that is intellectual disservice, and, needless to say, defeats the purpose of undertaking the task itself. Moreover, bringing out standardised reports to illustrate the fragility of states becomes further complicated when conflict ridden states are assessed along with those who are not equally conflict ridden or who may or may not share similarities in contexts vis-à-vis the persistence of conflict. A country’s geographical location and strategic significance, despite its internal incompetency and inadequacy, can attract regional or extra-regional players. Case in point is Pakistan. While dealing with decades-long homegrown malfunction like corruption, bad governance, load shedding, militancy and political hassles, it still holds strategic geography with plenty of ingredients to appeal to global powers. In the past few years, rumors have been roaming about that Islamabad’s foreign policy is nothing but a disaster. The United States’ Indian romance — it not only signed several economic ventures but also concluded defense agreements such as the 2016 Logistics Exchange Memorandum of Agreement and the Indo-U.S. Nuclear Deal in 2008 — hints at a shift in South Asian policy and a possible goodbye to Pakistan. Moreover, Washington’s “do more” demand has again surfaced and its discomfort with Islamabad is evident from the cuts in military aid (Coalition Support Fund) and its refusal to subsidize the purchase of F-16 aircrafts. The United States has also employed pressure on Pakistan after the Mumbai Attacks of 2008 and Uri Attack of 2016, demanding Pakistani cooperation with India in hunting down the perpetrators of these incidents. The other signs of isolation stem from Islamic countries like Saudi Arabia and Iran. Saudi Arabia kept cordial connections with Pakistan in times of trial and has been lending a hand in tackling financial woes. However, the Saudis have found it hard to digest Pakistan’s decision to remain neutral in the Yemen war. Although there was no dramatic response from Riyadh, the level of bilateral engagements has shrunk. Earlier this year Saudi King Salman bin Abdul-Aziz Al Saud warmly welcomed Prime Minister Modi and showed a possible tilt towards New Delhi and against traditional ally Pakistan. Non-payment of dues and detention of thousands of Pakistani laborers in Saudi Arabia can also be seen as Saudi discomposure with Islamabad. As China’s economy has grown and China has assumed the role of foremost global trading power, Beijing has extended its influence to the South Pacific. The latest development has been reports of a new mega-resort on the island of Yap in the Federated States of Micronesia (FSM). The United States, which has generally played the dominant role in this area that straddles key sea lanes of communications to the western Pacific, needs to keep a close eye on Chinese efforts to make inroads there. Otherwise, Washington could find itself strategically outflanked. While Yap and Truk (also part of the FSM) were major Japanese naval bases in World War II, the South Pacific has generally not been a point of great power contention since 1945. At the end of World War II, the U.S. assumed responsibility for the “Trust Territory of the Pacific Islands.” In the 1980s, the Compact of Free Association (COFA) allowed the various Trust Territories to become independent states: the Federated States of Micronesia, the Republic of the Marshall Islands, Palau, and the Commonwealth of the Northern Mariana Islands. Under the COFA, the U.S. maintains certain preferential policies towards the island nations, while also assuming responsibility for their defense. Citizens of the islands may join the U.S. military without first establishing permanent residency or citizenship. The U.S., in turn, can maintain strategic access through the waters that are encompassed by the various island nations. Some one-third of global trade and almost 50 percent of energy commerce passes through waters controlled by these island states. The history of the People’s Republic, according to the dominant narrative, falls into two broad sections: the turbulent decades dominated by Mao Zedong, the founder of “New China,” and the time of “reform and opening up” started by his successor, Deng Xiaoping. Now, however, the Chinese state has passed important political and economic inflection points. As a result, the third era of the People’s Republic—an era of crisis and instability—has already begun. In another time of instability and crisis, Mao Zedong began the first era on October 1, 1949. After defeating the Nationalist forces of Chiang Kai-shek, he moved the country’s capital from Nanjing and began twenty-seven turbulent years of overturning and remaking Chinese society. Mao began his reign by telling the people that they had “stood up,” but it was he who defined the period. He confiscated property, enslaved peasants, enforced conformity, repudiated culture. He embarked on horrific campaigns, most notably the Anti-Rightist Movement, the Great Leap Forward, and the Great Proletarian Cultural Revolution. He set back China decades with zany doctrines of “permanent revolution” and the like. Tens of millions died as he created his new state. Follow weekly commentary in Gordon G. Chang's World Affairs blog. The fight for Mosul has finally begun. On Monday, Iraqi and Kurdish forces, backed by allied militias and American air support, launched the long-anticipated campaign to retake what is perhaps the most critical population center that Islamic State captured in its 2014 onslaught, now its last substantial stronghold. After months of careful preparation, victory on the battlefield is all but assured. Yet when it comes to dealing with the operation’s humanitarian consequences, success is far from certain. That’s a grave concern, since the consequences are likely to be dramatic. The UN estimates that two hundred thousand people will flee the violence during the first few weeks of battle, seeking safe haven and shelter. That number may reach 1.2 million before the operation ends. The majority of them will not attain refuge in well-established displacement camps. Instead, they will be directed to “emergency sites” that provide only the most basic services. Last week, those sites had the capacity to hold sixty thousand people—far short of the number in need. The looming crisis compounds an ongoing one that has relief agencies and frontline states stretched to the brink. The number of people in Iraq who need some form of humanitarian assistance already exceeds ten million. That's nearly one-third of the country’s population. The scale of need is so great and the political terrain so fraught that the task ahead is daunting. Yet accomplishing it is necessary—not just for humanitarian reasons, but for political and security ones. Research shows that fear of or exposure to violence may exacerbate communal tensions, already running high in Iraq. That can harden political attitudes. The United States has been heavily involved in the greater Middle East, including the Persian Gulf, parts of North Africa, the Horn of Africa and Afghanistan in Central Asia, for over forty-seven years. The U.S. foreign policy establishment seems determined to stay there for at least another half century, despite that fact that our strategic objectives are unclear at best, and our ability to achieve much beyond short-term military successes has proved wanting. U.S. officials established an active military presence in the Persian Gulf in 1979 following the overthrow of the Shah of Iran, and the Soviet invasion of Afghanistan. Subsequently, the worst-case scenarios were averted—the collapse of the House of Saud, a Soviet victory in Afghanistan, and Saddam Hussein in possession of Kuwaiti oil fields. But Americans’ memories are also punctuated by tragedies and setbacks, from the Beirut bombing and the Mogadishu firefight, to the more recent disastrous war in Iraq and the ongoing fight against ISIS. These episodes often overshadow the day-to-day courage and sacrifice, as well as the individual acts of heroism, by the members of the U.S. military tasked with bringing order to a notoriously disordered part of the world. Saudi Arabia’s missile attack on a funeral hall crowded with hundreds of people in Sanaa on Oct. 8 is seen as the deadliest rocket attack on civilian targets in Yemen, killing and wounding 700 people. Meanwhile, the death toll of the war on Yemen has risen to 10,000 victims. Summary⎙ Print The recent missile attacks on US vessels off Yemen’s coast as well as the limited US response suggest that Washington may be disengaging from the war in Yemen and putting pressure on Saudi Arabia to follow suit. This deadly attack led to international condemnation, returning attention to Yemen’s war, which has been raging for more than 1½ years. Initially, Saudi Arabia tried to deny its responsibility for the attack, claiming that it was a suicide bombing, but later admitted it bombed the funeral hall based on wrong information from its Yemeni allies. The attack not only caused shocking human casualties, but has also reduced the chances of a political settlement, as the Saudi-led campaign targeted the funeral of the father of Jalal al-Rowaishan, the interior minister in the government formed by the Houthi-Ali Abdullah Saleh alliance in Sanaa two days earlier. The funeral was attended by top security and military leaders in the Houthi-Saleh alliance. The attack led to the death of some moderate politicians. Three officials in the UN Pacification Commission were killed, in addition to a neutral military officer, head of the Yemeni Republican Guard Ali al-Jaifi, who was likely to play an important role in the postwar period as a military leader acceptable to all parties. Abdul Qader Hilal, the mayor of Sanaa, was another consensual figure in Yemen who was among those killed. Iraqi soldiers in the Qayyarah area, some 60 km (35 miles) south of Mosul, October 19, 2016. BASHIQA, IRAQ – The campaign to capture Iraq’s second-largest city Mosul from the Islamic State is, at this stage, less a battle than a series of simultaneous skirmishes by relatively small units, at a distance from the city itself. And the force attempting to recapture the city, once the center of oil production in Iraq, is not a unified army but two separate formations – the mainly Shi'ite Iraqi Army and the Kurdish Peshmerga – divided by deep rivalry, if not enmity. The two forces are watching each other closely, as they make slow – and separate – progress toward Mosul itself. The campaign is in its second week and so far they are still miles away from their target, on independent front lines. The sophistication of the American Apache helicopter gunships hovering high over the frontlines – sighting targets kilometers away with advanced sensors and firing Hellfire guided missiles – belies the antiquated nature of the Peshmerga’s armaments. The Iraqi army may be armed by the United States, but the Kurds are reliant on Soviet-era weapons and hand-me-downs. In addition to their old Kalashnikov rifles, the main firepower of the Kurds is provided by ancient Dushka machine guns mounted on Japanese pickups, small cannons dragged into position by civilian trucks and one Grad missile launcher. New American-supplied TOW anti-tank missiles and Barret heavy sniper rifles are among the few weapons to have trickled down from the Iraqi Army. Isis militants hold up their weapons and wave flags on their vehicles in a convoy on a road leading to Iraq, in Raqqa, Syria. Before Iraqi forces and their US backers have set foot in Mosul, the US and its allies have begun preparations to imminently wrest the Syrian city of Raqqa from the Islamic State, a momentous decision aimed at destroying what is left of Isis’s self-declared caliphate. Although senior US defense officials and military officers insisted that “overlapping” operations to capture both cities from Isis had always been planned, preparations to take Raqqa are proceeding with “urgency”, the US commander in Iraq said on Wednesday, because of a credible threat of retaliatory Isis terrorism outside the Middle East. Accordingly, US military officials planning the Raqqa fight have yet to resolve major geopolitical complications within their own coalition, particularly those involving the Kurdish force the US has relied upon in Syria and its enemy, Nato ally Turkey, which wants a substantial role in the operation. The US defense chief, Ashton Carter, meeting in Paris with his counterparts in the anti-Isis coalition, vowed that Iraqi forces, Syrian Arab and Kurdish allies and US special operations troops and airpower could take away Isis’s Iraqi and Syrian capitals practically simultaneously. The Western alliance has taken a significant step towards upping defensive capacities along its entire eastern flank amid growing concerns about Russia. Romania and Bulgaria will both host an increased air force presence, designed to undertake surveillance missions over the Black Sea. It is the biggest NATO deployment since the Cold War and comes as Russia pushes on with its biggest naval deployment since the Cold War, with the Admiral Kuznetsov, Russia’s only aircraft carrier, leading a convoy of eight ships towards the Eastern Mediterranean along the European coast. This month, Russia also deployed nuclear-capable missiles in Kaliningrad on the Baltic, increasing nervousness in Poland and in the Baltic states. Last month, Russia suspended a weapons-grade plutonium agreement with the United States. Tensions between the West and Russia have mounted since Russia annexed Ukraine’s Crimea region in 2014, as a result of which Western countries imposed sanctions on Moscow. Obamacare Is Dying. House Republicans Have the Fix. President Obama and his administration use every opportunity to boast about his flagship domestic legislation, the Affordable Care Act (ACA), also known as “Obamacare.” These near-weekly public relations efforts aim to convince the American public that the program has been a success. The administration frequently references the increased number of people with insurance in these efforts, despite the fact that enrollment numbers are not even half of the original projections, and still emanate primarily from the law’s Medicaid expansion. The number of people enrolled into a government program is not the right basis for judging success. Health care systems are intended to treat and heal people, so what fundamentally matters, and what the administration has said little about, is how the people who need health care are being treated. Access to care, medical outcomes, and cost are the metrics that matter, and on these fronts, although Obamacare is just a few years old, the administration has little to brag about. The administration’s focus on insurance coverage is understandable, because this is essentially the only Obamacare metric that is improving. Yet, as coverage numbers rise, all major insurance companies have been forced to scale down participation in the individual market. As the relatively healthier young adult population fails to sign up for coverage at the rate the administration needs to help balance out costs, United Health Care, Humana, Aetna, and BlueCross BlueShield have had to pull out of many insurance markets due to heavy financial losses. Numbers released for the start of Open Enrollment next week, show an average of three insurers per county in 2017, down from five in 2016. HHS officials confirmed that one in five people living in states using HealthCare.gov will only have a single carrier to choose from next year. This is not what the president promised America. In this narrative, Russia and its robust Arctic presence are regularly trotted outto dramatize the situation and present as an ominous reason for other countries to more proactively turn their attention and investments northward. The frequent comparisons between Russia and the United States are good examples of this practice: Russia has over 40 icebreakers while the United States has only two; Russia is massively upgrading its Arctic military capabilities while the United States remains relatively stagnant; etc. If the United States doesn’t shift into high gear Arctic-wise, the implication is that Russia will follow its horde of icebreakers to conquest and riches while America simply looks on. VENICE – “The main element of any US policy towards the Soviet Union must be that of a long-term, patient but firm and vigilant containment,” the US diplomat George Kennan wrote in 1947 in aForeign Affairs article, famously signed “X.” Replace “Soviet Union” with “Russia,” and Kennan’s “containment policy” makes perfect sense today. It is almost as if, in nearly 70 years, nothing has changed, even as everything has. Of course, the Soviet Union has been, one might say, permanently contained. But Russia is showing the same “expansive tendencies” of which Kennan warned. In fact, today, the level of trust between Russia and the “West” is at its lowest point since at least the end of the Cold War. 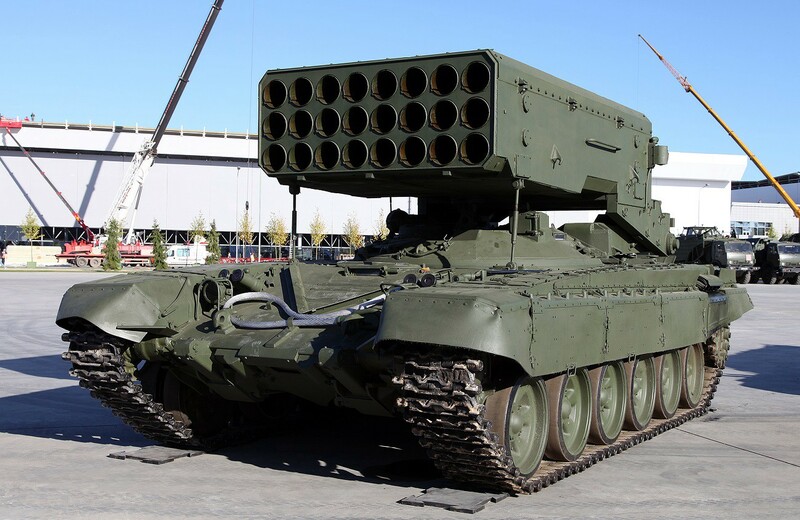 According to Vitaly I. Churkin, Russia’s ambassador to the United Nations, the current tensions “are probably the worstsince 1973,” when the Yom Kippur War brought the United States and the Soviet Union closer to a nuclear confrontation than at any time since the Cuban Missile Crisis. Such pessimism is warranted. This year alone, the sources of discord with Russia have multiplied and deepened. Russia has withdrawn from a number of nuclear agreements, and the Kremlin recently placed Iskander missiles, which can transport medium-range nuclear devices, in Kaliningrad, near the Polish border. Moreover, the Ukrainian crisis is far from resolved: the Minsk ceasefire agreements are not respected, and armed conflict may escalate at any moment. And it seems likely that Russia has been intervening directly in the internal politics of Western democracies, using leaks of sensitive documents and financing right-wing populists, from Marine Le Pen to Donald Trump, who would be supportive of the Kremlin. They are so recent, and yet they seem so far away; those 20-odd years during which the United States happened to be the sole hegemon of global stature. Now, a new cold war between Moscow and Washington is taking shape at an alarming pace. Never, since the Cuban missile crisis in October 1962, has direct military confrontation between Russia and the United States -- and not only conflict through proxies -- appeared to be as plausible as it looks today. Then you have China, whose sovereignty claims over the South China Sea pose a major challenge to U.S. allies in that region and, consequently, raise the specter of a military showdown involving the United States. Given the profound readjustment of the international balance of power that has taken place during the past few years, the methods of dealing with crises and conflicts will have to be thought of afresh, and adjusted to the new circumstances. We need to essentially abandon a basic postulate of U.S. foreign policy, namely that America’s involvement in world affairs can and should be geared toward the resolution of conflicts. That postulate doesn’t work in the emerging multipolar order, for one simple reason: The priority of the contending powers -- Russia and China -- is to expand their weight and influence, and edge out as much as possible the leading hegemon, the United States. (Yes, the struggle for primacy is a zero-sum game.) Those powers are less interested, if at all, in preventing or solving conflicts than they are in playing the gadflies of the United States. MADRID — Russia abruptly withdrew its application on Wednesday to dock three warships for refueling at a Spanish port, shortly after Spain’s partners in NATO urged Spain to turn away the vessels. The ships are heading to the eastern Mediterranean Sea to support Russian military operations in Syria. 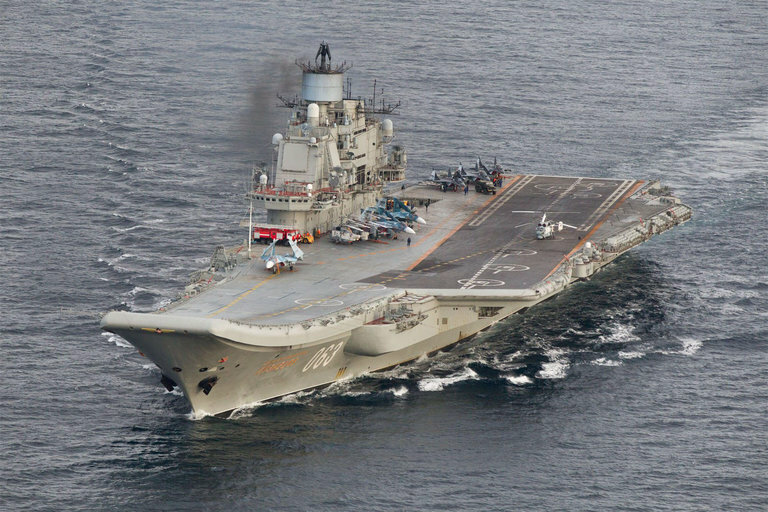 Russia’s intention to dock the three warships, which were said to include its only aircraft carrier, the Soviet-era Admiral Kuznetsov, at Ceuta, a Spanish enclave on the north coast of Africa, was first reported in the Spanish news media on Tuesday evening. The development set off alarm bells among the alliance defense ministers, who gathered in Brussels on Wednesday for a two-day meeting and warned Spain not to let the Russian ships dock. The Atlantic alliance’s secretary general, Jens Stoltenberg, told reporters that while Russia had the right to operate in international waters, the situation at Ceuta was different because of concerns that the aircraft carrier group would mount strikes on the Syrian city of Aleppo. What Happens to Guardsmen Who Repaid Bonuses?